Who among us is always looking for someone else to blame? Have you considered WHY that is? 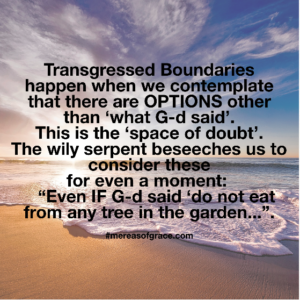 Transgressed Boundaries happen when we contemplate that there are OPTIONS other than ‘what G-d said’. This is the ‘space of doubt’. The wily serpent beseeches us to consider these for even a moment: “Even IF G-d said ‘do not eat from any tree in the garden…”. He plays to our assumptions within that ‘space of doubt’. The mystics call the tree of the knowledge of good and evil, ‘the tree of doubt’. (Haman and his progenitor Amalek mean DOUBT and this is what G-d told Moses ‘must be blotted out’. DOUBT is rooted in the soil of pride, and thus possesses ‘no reverential awe of G-d’ – ‘the beginning of wisdom and knowledge’). We each have a Divine Role in restoring harmony in our Gardens of Eden. In the Messiah, we are empowered to Respect and Protect G-d’s Boundaries of Delight as His co-creators of GOOD. And as we remain watchful guardians accomplishing good, BEAUTIFUL THINGS WILL BEGIN TO GROW within. We choose either the life of holy conviction or one of ongoing conflict by how well we ‘respect and protect The Boundaries of Delight’.